A beautiful example of early Dolce & Gabbana with no bobbling or marks. Outer arm 21.5". Length from back excluding collar 33". 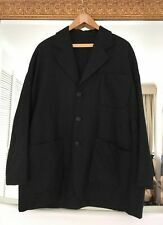 MENS WOOL MIX DESIGNER PAUL SMITH MAINLINE EPSOM WINTER COAT BLACK GREY GREEN L. Condition is Used. Dispatched with eBay delivery – Shutl 2-3 days. Fabric: 100% Wool. Lining: 100% Cotton. 100% authentic, bought directly from Hackett. Now, how many people can do that?. Photo: This is exactly what you will get. Woollen material is a flat, close weave. Very smart. Wool jacket / blazer. Dark grey with black to upper section of collar/lapel. Two-button fastening / single vent / lightly structured shoulders / lined / 4 working buttons to cuffs / 3 outside pockets / 2 inside pockets / slim lapels / spare buttons. Fabric woven in England. Pure new wool (95% wool, 5% mohair). Size (S) - (36 - 38). TO FIT CHEST 40" REGULAR. REGULAR FIT. OUTSIDE ARM 26" (SHOULDER TO CUFF). INSIDE ARM 18" (ARM PIT TO CUFF). SHOULDER TO SHOULDER 18". 4 INSIDE POCKETS. VISCOSE & ACETATE LINING. DOUBLE VENT. Henri Lloyd Lazer MK II winter jacket. Quilted Lining. Wool blend see label. Pit to pit 26. The lining is a smooth satin material with adjusting strap at the back to allow the waistcoat to be brought in if required. Dress Shirts. White Tie Tailcoats. Gloves & Scarves. The SB3 is a three-button jacket — that's SB as in single-breasted, and 3 as in three. It is wool which is spun and woven such that it feels smooth — not in the least bit woolly — and is breathable, so can be worn all year round. MARKS & SPENCER AUTOGRAPH EXCLUSIVE REDA 44" LONG WOOL JACKET GREY 112cms 100% WOOL BUTTONS TO THE FRONT AND SMALL BUTTONS ON SLEEVE TWO FRONT POCKETS AND 3 INTERNAL POCKETS. IN EXCELLENT CONDITION WORN ONCE. Amazing quality coat from Mario Zegna, Trivero, Italy in a superb soft grey herringbone pattern in a luxurious 100% Wool fabric in great condition. Grey Italian Overcoat. The coat has 4 hidden front buttons, 2 external pockets, removable tie belt and a sumptuous lining. ** ** Nuevo Salsa de impresionante la mezcla de lana con textura Kooples Para hombres Abrigo XL 42"
The Kooples. Pictures are of actual item. Perfect option for any fashion-conscious man. Padded at the shoulders, this textured layer has been finished with a removable faux-fur collar, notch lapels and buttoned cuffs. Size UK 44R/EU 54R. Belgravia Fit. Single vent. Working button holes on sleeves. Brown suede elbow patches. Half-lined with black cotton and beautiful detailing (see pictures). Made in Italy. In pristine condition. 100% Genuine Pal Zileri Jacket. 42" chest (Italian 52). Superb TUMI jacket, I have put on weight and have only worn this a couple of times - the tags have been removed but the coat is in perfect condition Cost over £260 new - grab a bargain I am open to sensible offers. Paul Smith 100% wool dark grey bomber jacket in a size large. Burberry jacket. - 100% Wool. 100% authentic or your money back. - 2 Button. - Single Breasted. Amazing Pierre Cardin Jacket - 44R. This jacket has black buttons on the front and cuffs, flap pockets, double vent and a beautiful black lining with "Pierre Cardin" embossed throughout which finishes it perfectly. Grey colour. Single breasted. Black velvet collar. Grey lining with one internal pocket. A truly wonderful overcoat. Dry cleaned and steam pressed before being listed. IN THIS INSTANCE A SIZE 42 SUIT WILL NEED A SIZE 44 OVERCOAT. This is a nice jacket byDANIEL HECHTER. This is a great classic blazer. The jacket has a single breasted button fastening that match the cuffs. This will look great with jeans or for a special occasion. A truly superb AllSaints Compton Coat. Worn just twice this coat remains in a lovely. the length from the shoulder to the hem is 38". and the sleeve from the pit to the cuff is 20". An outstanding, high quality gents blazer / suit style jacket by M&SSAVILE ROW Inspired collection. Darker charcoal colour. 100% pureorganic wool fabric byZIGNONE of Italy. Length 30.5", sleeve length 26". Great quality item, good condition, hardly every worn. £425 2018 MUSTO DECK PEACOAT L-42” GREY 100% WOOL JACKET STUNNING! ZIP/BUTTON NAVAL. - Collar = L- fits around a 42” chest. All collars and cuffs are clean, crisp and sharp -. Unsure about an item, or need extra information?. El Kooples Slim Fit Chaqueta de Lana £ 425 para hombre Talla 38/48 Sr. Porter Blazer Medio. The Kooples Jacket. The Kooples Insignia Buttons on the cuffs. Originally priced around £425, see last pic for similar all wool jacket currently available on The Kooples website. 100% Wool, lovely quality. Vintage Herringbone Crombie Grey Tweed Men’s Overcoat Long Wool Coat. Excellent condition. Can’t find any obvious flaws. Chest measurements approx 64cm from armpit to armpit Back length approx 118cm from top back of collar to hem. Arm length approx 84cm from middle of collar to cuff - arms are quite short! Any questions please message me. The quality of this jacket is outstanding. THE BLAZER HAS A SINGLE VENT. Grey stripe wool. Amazing quality and very expensive. TO FIT CHEST 42" REGULAR. 3 FRONT BUTTONS/ SINGLE BREASTED. SHOULDER TO SHOULDER 18". OUTSIDE ARM 25" (SHOULDER TO CUFF). INSIDE ARM 17" (ARM PIT TO CUFF). SHOULDER TO WAIST/ HEM 30". BOTTOM OF COLLAR TO HEM 30.5". This is a Hugo Boss Jacket Blazer. It is Grey Plaid Check. Chest: 44" Regular. Shoulder to Shoulder: 20". Length: 32" From Base of Collar to Hem. Armpit to Cuff: 16.5" Shoulder to Cuff: 25.5". Armpit to Armpit when laid flat: 23.5". The coat is in excellent condition. Lightly padded and quilted interior makes the coat really warm, but is also very smart so can be dressed up or more casual. The labels in the pictures show all the material compositions. A very nice Grey Wool Overcoat by Tommy Hilfiger. It has been worn, but is still in excellent condition as can be seen in the photos. It is single breasted, with 5 buttons on the front, with pockets on the side and inside too. It is plain dark grey in colour and is a long, single breasted style with a 3 button fastening, it has 2 flapped pockets at the front and has a single split at the back, it is fully lined with a high class lining and has 2 inside pockets. • Detachable hood - zip on/off. Shell - 70% wool, 20% polyester and 10% viscose. Lining - 100% nylon. Length (back collar seam to hem): 26" (65cm). Pit to pit: 22" (56cm). Label Size: L.
Classic fit. Shoulder to shoulder 19". 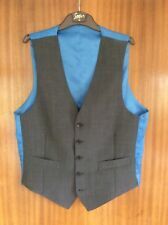 NEW Gentleman’s 5 Button Pure New Wool waistcoat with Alfred Brown Cloth. Made in England. Superb quality and attention to tailoring detail. Buttoned, the measurements are: Pit - Pit 22.5” Top Shoulder Across 14.5” Back Length 22.5” Thank you very much for looking. Pattern: Stitched pattern. Main Colour: Grey, blue & brown. Material: 100% Wool. Chest Size: 42" (estimated). Pockets: 2 Waist, 1 Chest, 2 Interior. Pit to pit: 21". Zip down with decorative duffle toggles. - Size XXL. - Material Wool. Harry Brown debuts contemporary and stylish high-quality outerwear. The single breasted coat features sophisticated lines, with a classic notch lapel and two front pockets. This wool blend coat is slim fitted, ideal to be worn with suits or smart casual looks. Size IT 50 - UK 40" Chest. Double Vent at the Rear.